"Helping the YMCA is helping the whole community. When you help the YMCA you are helping children learn about team work, you are helping seniors enjoy water exercise classes, you are promoting early education through our child care and you are helping sustain one of Jasper County's largest non-profit organizations." ~ Frank Buckley, Newton YMCA C.E.O. With a focus on youth development, healthy living and social responsibility, strengthening the communities we serve is our cause. At the Newton Y, we believe that lasting personal and social change happens when we all work together. The Newton YMCA continues to be an important asset to the communities we serve. Membership and Program Fees, however, only cover roughly 67% of what it takes to operate the Y. That’s why the Y seeks mutually beneficial relationships with reputable, caring businesses or corporations who see the value and community benefits offered through the Newton YMCA. Proud Sponsor Signs :: Your business can show it supports the Newton Y by displaying promotional signs located in the main gym and aquatic area. Three sizes of signs are available; 4’x7’, 3’x5’, or 2’x3’. The signs are a great way to advertise while displaying your support in building a stronger community. Activity Guide Ads :: Get your business noticed by placing an ad in our seasonal Activity Guides. 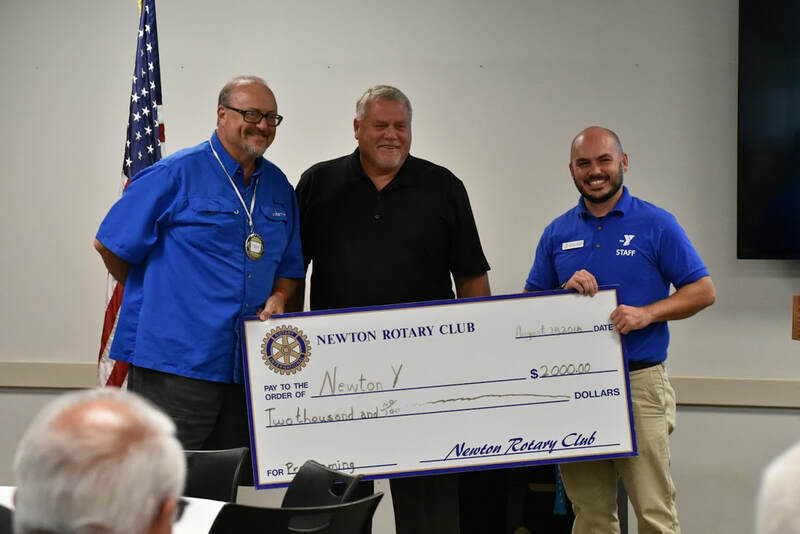 Approximately 13,000 guides are distributed throughout Jasper County and are used regularly by members and non-members who want to know what is going on at the Newton Y. Typically, there are 3-4 seasonal guides each year. Program Sponsorship :: Keeping the numerous programs offered through the Newton Y can become a worthy cause for your business. Program fees only cover a small portion of the actual program costs, so a sponsorship helps make up the difference, thus keeping the program alive. In addition, your business receives recognition through sign-up forms, participation certificates, activity guide articles, and in most cases your business name can be on a T-Shirt. Fundraiser & Special Event Sponsorship :: Fundraisers and Special Events are beginning to play a larger means of the Newton YMCA to raise money for those “Non-operational” expenses. Beyond revenues generated, sponsorship by businesses help offset the costs of these events which impact the bottom line. As a business sponsor you receive recognition through pre-event advertisement and at the specific event. A sponsorship is truly a “win-win” for your business and the Newton Y. Annual Campaign :: Many businesses have given to our annual financial assistance campaign to ensure “No one is turned away because of the inability to pay." This fund provides youth, adults, and families’ membership and program assistance. All donations are tax deductible and your business will be recognized as an Investor of our Community. If your business would like to invest in our community through the Newton Y, please contact Frank Buckley, C.E.O. by phone at (641) 792-4006 or by e-mail frank.buckley@newtonymca.org.